Woosh...check your email for a link to the special offer! 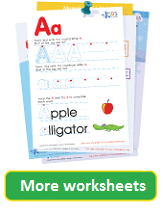 Expand your practice beyond the screen with our collection of kindergarten and preschool worksheets on every subject from alphabet and reading to math, writing and spelling. Select the worksheets you need, download, print out and get started in seconds! As loving parents, we decided to establish TinyHands out of desire to create high quality and engaging games that will help our children acquire new concepts and improve their skills. In addition, we design our games to provide quality playtime for parents and children together. For improved playing experience for your child it is recommended to de-activate Multitasking gestures in your iPad settings which may cause interruptions during game play. iPad settings> general> Multitasking gestures, and turn them off. > Can I transfer a purchase between iPhone and iPad? Please open the "Parents zone" located in the home page. At the bottom, you will see a Restore button, please press it and complete the process. Make sure you are using the same Apple_id that was used when the purchase was made. Check the small side switch of your device (located next to the volume Button), Sometimes it is used as a mute button. It is even possible that you can hear other apps because not all apps are sensitive to this function. In your iPad settings go to: General -> USE SIDE SWITCH TO: and set it to "Lock Rotation". Make sure your device volume setting is high enough. If that doesn't help, please try reinstalling the app and restarting your device. After installing the app on your iPad: Open the "Parents zone" located in the home page. At the bottom, you will see a Restore button, please press it and complete the process. Make sure you are using the same Apple_id that was used when the purchase was made. At this point it is not technically possible for us to transfer purchases between iPad and iPhone apps. NEW! Kids Academy - Award-Winning Early Learning Program Welcome to the complete learning course for kids from 2 to 6. It is a breathtaking journey that lets kids into basic shapes, patterns and colors and moves on to savvy writing, reading and math concepts. It spans a handful of activities, from games and videos to augmented reality and off-screen activities. The app offers a rich environment filled with effective motivation and rewards system. NEW! 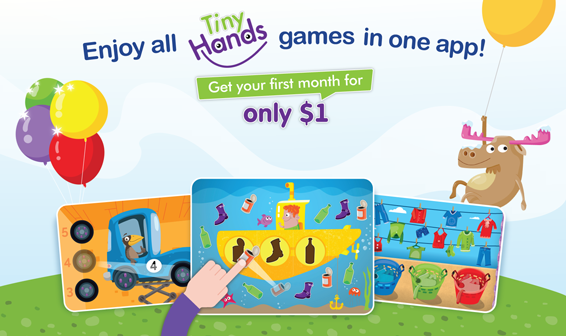 TinyHands Sorting 1 is the first and most simple game in our Sorting series. The game is designed to help children acquire basic concepts such as shape, color, size seasons and animals. NEW! TinyHands Raccoons Treehouse Join the Raccoon family in their treehouse! Children will learn basic concepts such as shapes , size colors and patterns while helping the raccoons in various activities around the house. The app helps children practice their knowledge and skills through a variety of activities such as sorting, matching and memory. NEW! TinyHands Arctic Birthday Have fun and practice basic skills while helping the penguins organize a birthday party for their friend - the polar bear. Learn about colors, patterns, shapes and size by helping the penguins hang decorations, prepare refreshments and even clean up after the party! NEW! TinyHands Sorting 3 is the third game in our Sorting series. Like TinyHands Sorting 1 and 2, this game teaches about sorting, but it also contains more complex sorting environments such as sorting by concept combinations and contextual classification. TinyHands Santa Toy Factory Help Santa build cool toys for all the kids in his Toy Factory. Learn about shapes colors and sizes as you build toy parts, assemble them and wrap beatutiful gifts. The prfect game for the holiday season (and the rest of the year as well). TinyHands Fairy Tales Domino Practice your matching and attention to details skills in this magical fairy tale themed Domino matching game. This game provides parents and children with the opportunity to learn the basics of the domino game while remembering classic fairy tales. TinyHands Connect The Dots This game is designed to introduce toddlers with numbers and sequencing. The game consists of 12 mini game boards where children draw by numbers and reveal magical scenes. TinyHands First Words is an educational Matching game designed to help children recognize first words and basic concepts. The game consists of 10 boards, each focused on a different theme from the child's world such as shapes, colors, clothes, animals and vehicles. TinyHands First Words 2 This is the second game in our First Words series. The game consists of 10 boards, each focused on a different theme from the child's world such as clothes, seasons, body parts and more. TinyHands Towers 1 The game is designed to help children acquire basic concepts such as: big VS. small, before VS. after, and bottom VS. top. TinyHands Towers 2 This game includes more complex towers built vertically but also horizontally. It is designed to help children acquire basic concepts such as: big VS. small, Left vs. Right before VS. after. TinyHands Whats My Pair 1 is the first and most simple game in our pairs matching series. This educational game consists of 12 boards, focused on a variety of visual perception attributes. The child is challenged to match different objects from his world such as balloons, clothes, animals, fruits and vegetables according to their similarity. TinyHands Whats my pair 2 is the second game in our pairs matching series. Like "Whats my pair 1" it is based on pairs matching, but it introduces more challenging concepts such as logical groups, counting, numbers, and associations. In most cases this game requires the child to UNDERSTAND what he sees in order to make the correct match, as opposed to matching by visual similarity. TinyHands Whats My Pair 3 This game is the third and latest game in our Pairs matching series. Like previous games in this series, it is based on pairs matching but also introduces more challenging concepts such as logical groups, counting, numbers, and associations. TinyHands Sorting 2 is the second game in our Sorting series. This game includes basic concepts, but it also contains context based sorting and classification environments. TinyHands Town Center The game consists of 10 beautiful shops each focused on developing a set of basic concepts such as size, colors, numbers and patterns using everyday objects from the child's world such as clothes, food and many more.